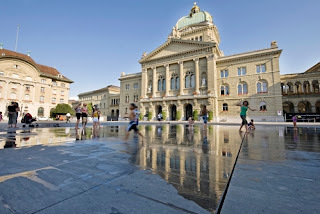 I recently did a tour of the Swiss Parliament in Bern. We got to sit at the desks in one of the two main chambers where the delegates meet and vote. So to vote, the delegate has to press two buttons. The control button is on the front-left of the desk. The main Yes/No/Abstain buttons are on the back right of the desk. To vote, the user must press the control button and one of the main voting buttons at the same time. Both hands are occupied. The ideas is that the delegate cannot vote for an absent neighbour . Anyway that's what our guide said.